US on holiday this Monday, EUR/USD set to consolidate, correct modestly. ECB's jawboning will likely resume, but speculative interest will probably ignore it. The Dollar Index plummeted to its lowest in three-years last Friday, resulting in the EUR/USD pair ending the week at 1.2193, its highest settlement since December 2014. Following Thursday's rally, triggered by softer-than-expected US PPI figures, the pair rallied in the last day of the week on news indicating that German parties' made progress toward forming a coalition government. It has been almost four months since German's election, and while talks will continue, the headlines indicating that the CDU/CSU and SPD parties have reached an agreement on forming a coalition, fueled an already bid EUR. Adding to the bullish case of EUR/USD was US inflation as it resulted barely up in December, up 0.1% in the month from previous 0.4% and the expected 0.2% MoM. Core readings were upbeat, up 1.8% YoY, and 0.3% MoM, while Retail Sales post a modest 0.4% advance as expected. ECB's Weidmann tried to talk down the common currency by saying that normalization of monetary policy will be a long path, but his words made no dent in bulls' determination, which pushed the pair up to 1.2218 ahead of the close. This week is set to start in slow motion as the US will be on holidays, while the EU will only release November trade balance, hardly a market mover. That would give the pair a chance to consolidate/correct, although bulls´ conviction remains strong, and higher highs are still on the table. There won't be relevant macroeconomic releases until Wednesday when EU inflation will be out. Technically, the rally seems overstretched, but there are no technical signs that it has ended. In the daily chart, and after a three-day battle around it, the price surged far above a now bullish 20 DMA, while technical indicators reached overbought territory with almost vertical slopes. Shorter term, and according to the 4 hours chart, technical indicators keep heading north despite being in extreme overbought readings, while the pair is far above bullish moving averages. 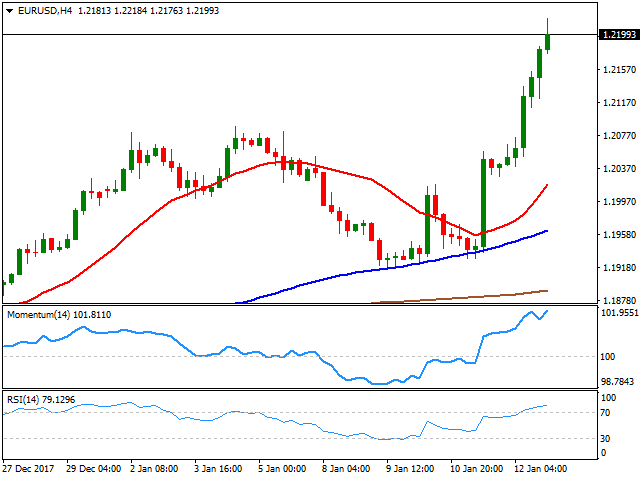 Above the mentioned high, the pair has scope to extend its advance to 1.2260, a strong static resistance area, in where bulls may choose to take some profits out of the table. Beyond the level, however, speculative interest will begin thinking on 1.2500 as the next possible bullish target.